The conversion of strategic intentions into plans, actions and outcomes, falls to organizational leaders who find themselves pushed and pulled between running day-to-day operations, while at the same time changing them according to a strategic plan that promises future success. 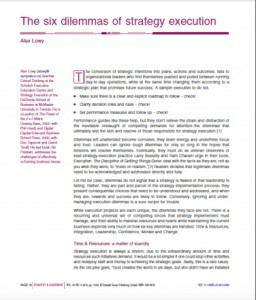 Alex Lowy’s latest article, “The Six Dilemmas Of Strategy Execution,” in the most recent issue of Strategy & Leadership (Vol. 43 No. 6, 2015)provides a roadmap for executives to consider and address these challenges. This is the “Pre-Mortem Question” one of five exercises in strategic review that Alex Lowy recommends in the article “Five Reframing Questions Every CEO Should Ask,” in the lastest CEO Advisory from Emerald Group Publishing. Download the article here. Alex Lowy (alowy@sympatico.ca) teaches Critical Thinking at the Schulich Executive Education Centre and Strategy Execution at the DeGroote School of Business at McMaster University in Toronto. He is co-author of The Power of the 2 x 2 Matrix (Jossey-Bass, 2004, with Phil Hood) and Digital Capital (Harvard Business School Press, 2000, with Don Tapscott & David Ticoll). His last book, No Problem, addresses the challenges of effectively reframing business issues.